There are two kinds of people in the world. Those who know their spiritual gift and those who don’t. Of course, I exaggerate, but do you realize how weird that sounds? If it’s possible to over-simplify and over-complicate anything in the Bible, I think we score highly when it comes to spiritual gifts. We take those “spiritual gift tests” to find out what our gift is. And then when it comes out as a tie, we wonder which question we answered incorrectly. What if we live the rest of our lives not realizing that the gift we think we have is not actually our spiritual gift at all? At least now we know there aren’t other gifts floating around out there that we don’t know about. “Nope, that’s not on the list,” we say. Um, so what does the Bible say? The lists are not all the same. Now it seems to me that if three different lists contain some overlap but are not perfectly parallel, what you may have on your hands is a list of examples. Not to mention Paul says, “There are varieties of gifts” (1 Cor 12:4). Spiritual gifts are spiritual. If the Spirit lives in you, you have at least one. Use your gifts, and use them the way God says to. And when in doubt about what your gifts are, be available and be obedient, and it’s likely your gifts will be put to good use. Now what was so hard about that? 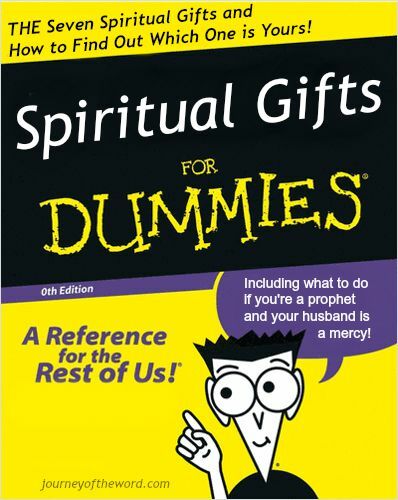 I think there is a misunderstanding as to what exactly a spiritual gift is as well as which ones we still have. We seem to live in a society that changes definitions at will to fit how we think. Sometimes it makes some logical sense such as above, but no matter how we want to currently define things, if we want to know what something in the Bible originally meant, we need to look at how the Bible defines it. Spiritual gifts as defined in the Bible are not just talents but miraculous abilities sudden given to the church by the Holy Spirit for the purpose of fulfilling prophecy and giving us the confirmed Word of God in Scripture. With the prophecies fulfilled and Scripture completed, the purpose of the gifts was over and they faded away and ended. Those that remain are what are called the best gifts, the remaining gifts: faith, hope, and love. I’ll quote at least a little scripture rather than giving absolutely nothing to support this. I definitely disagree that the spiritual gifts have ceased. Perhaps some have, but certainly not all. I read most of your comments on the HSA discussion as well, but I’m afraid I don’t follow your line of thinking. And, again, I don’t see anything which would indicate that “spiritual gifts” have ended. But that’s a huge topic for another day. Just to clarify, I wasn’t saying that those things were spiritual gifts, nor am I saying that all those things listed in the given scriptures were spiritual gifts. What I was saying is that we seem to live in a society that changes definitions at will to fit how we think. I disagree with this way of defining things as it seems you do as well even though we may still disagree on how the Bible defines them. To clarify again, I don’t believe all spiritual gifts are ended because I believe faith, hope, and love abide. However, I do believe those are the only ones remaining. Still indeed, that may be a discussion for another day. Yeah, I just don’t see how you draw your conclusions, even in that last HSA post. I don’t think faith, hope, and love are necessarily spiritual gifts. At least there’s no biblical evidence that they are. And I would venture to say that none of the spiritual gifts have ended. Because, again, I don’t see any biblical evidence that they have. Perhaps a few of them don’t have the same appearance to us now that they did in Bible times. But I think the spiritual gift passages, as a whole, still apply to us today, because I don’t see any reason why they wouldn’t. Right, I am seeking to define terms as the Bible defines them. If the Bible says faith, (or hope or love) is spiritual gift, then it is. If it doesn’t, then it may or may not be, but we can’t say it is (or is not) definitively (backed with Bible authority). Then he talks about how the other gifts will end but the “best gifts” and “more excellent way” will continue with love in particular lasting forever! However, no matter if you see them as spiritual gifts or not, they will outlast the other spiritual gifts which is actually an important point showing that the other gifts are ended. Again, this is brought out somewhat in the last post that I linked to. Did you go back and see the last message in the link I gave? It’s an extremely simple summary. If nothing else it should at least allow you to easily understand how I draw my conclusions even if you don’t agree. I did read the link, and I simply don’t come to the same conclusions. I think your ideas are a possibility, but certainly not something we can say for sure. Just because faith, hope, and love “replace” the spiritual gifts (and I’m not sure they do), doesn’t mean they are spiritual gifts. He never says those three are spiritual gifts and so we should ignore the others. It just seems to me that you’re drawing conclusions that aren’t explicitly there. When I read those passages, I don’t come to your conclusions. Your conclusions make some sense, so I see them as a possibility. But the Scriptures do not lead me there. At least so far in my study. I haven’t yet studied 1 Cor in-depth. But thanks as always for sharing your thoughts! Very insightful! Oh, and just to clarify. I do realize that some Scriptures seem to indicate that some particular spiritual gifts will end eventually. Though I’m not sure when. And I’ll have to study those passages some more! Well at least I guess you see where I’m coming from. Still, as I said, that was a brief summary, so I imagine not convincing by itself. There’s a lot more in Scripture about it (hence I’ve written a book on it lol). I do encourage you to study it out. I heard someone say recently that the spiritual gifts are like a palette into which God dips His brush. My painting may have three or four colors on it, and in varying intensities and hues so that my “gifting” is completely unique from someone else for whom the brush hit the same puddles of gift-paint, but in a different mixture. I’m no theologian (too much laundry to do), but that description resonates for me because I see in it the fingerprint of God and His unique crafting of His children. Thanks, Lydia, for your fresh perspective. I love your informative overview of the scriptures that list the gifts. Thanks for sharing on the #LMMLinkup this week. Thanks Lydia for an informative post. Great job. love your bottom line – and the more you use it, the more you know it’s from God (I know, I’m old) – and hospitality isn’t one. (: it’s a commandment.